Greeks, Romans, Byzantines, Normans, Swabians, French and Spaniards have all shaped the art and culture of Puglia, one of the most fascinating and beautiful provinces of southern Italy. The region is known for its highly decorative Leccese baroque style, which dominated art and architecture from the 16th to 18th centuries. 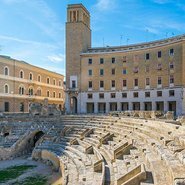 Explore the rich artistic heritage of the region as Steven Miller guides you through time and landscape; from celebrated Greek Apulian vase paintings to the vibrant contemporary art scene in the coastal capital Bari.